Appleby Creek Bed and Breakfast, is located in one of Tasmania’s best kept secrets, Port Sorell, on the North West Coast of Tasmania a short 15 minute drive from Devonport and the Spirit of Tasmania Ferry terminal and 10 minutes from the Devonport airport. 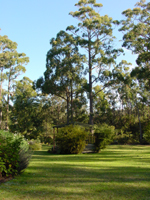 Appleby Creek Bed and Breakfast is a large country home standing amidst a haven of beautiful tall gum trees and natural bushland with green rolling lawns. We offer you a superb four star Bed and Breakfast accommodation in complete seclusion and tranquillity. Our rooms are private comfortable and warm. All rooms have direct access to the garden, so you don’t have to walk through the B&B. Narawntapu National Park known for natural fauna, wildlife, whale spotting and friendly beaches. Latrobe famed for Platypus, Antique shops, Cafes and restaurants, Anvers Chocolates, Axeman’s Hall Of Fame and Bell’s Parade. Devonport home to the Spirit of Tasmania, Mersey Bluff, the lighthouse and the Don River Railway. Ulverstone, Antique shops the war memorials and the Ulverstone clock.There are other attractions, including Penguin, Burnie, Stanley and its Nut, Sheffield with murals, Cradle Mountain, Launceston, the Tamar Valley, Ashgrove Cheese Factory and The Christmas Hills Raspberry Farm just to name a few, all good day outings. For Special occasions why not hire the complete lodge! 3 Person Suite consisting of a queen size and a single bed,a spacious bathroom with all the facilities you could need, including a bath and seperate shower. A continental breakfast is served in the breakfast area of the suite, which has a microwave,toaster,kettle and all the necessary utensils to make your stay comfortable. There are free BBQ facilities to use in the garden. 3 Person Private Suite consisting of a queen size and a single bed, a spacious bathroom with all the facilities you could need including a bath and separate shower. A continental breakfast is served in the breakfast area of the suite, which has a microwave, toaster, kettle and all the necessary utensils to make your stay comfortable. There are free BBQ facilities for guests to use in the garden. 2 Double rooms with a queen size bed, each room having an ensuite, a small breakfast area for the continental breakfast which is included, also each having a microwave,toaster, kettle and all the necessary utensils to make your stay comfortable. Free BBQ facilities are available in the garden.